Follow My Blog to get weekly updates on the quilts That I am working on right now, Im always doing something new. its a fun Blog of my ” quilts in progress” Check me out!! 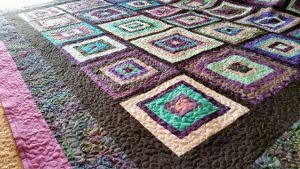 I make my quilts from start to finish, from buying the fabrics making the quilt top, and the free form freemotion quilting. I am not a computerized quilter. I pride myself in professional quality work. This Is a custom Order, you can choose your colors and size and make it your own. Would be great in Multi colored also, but the black make it a lot more Modern. HOW to Gauge the SIZING for your needs? I don’t go by size names, I go by inches. You really need to take your measures to know what your wanting. Custom Quilts aren’t like buying store bought bedding. I make my order larger than ordered so that after washing and drying, and the after shrinkage happens it is the size you ordered. My Suggestion is to order one size up from your bed. I’m happy to help answer any of these questions.